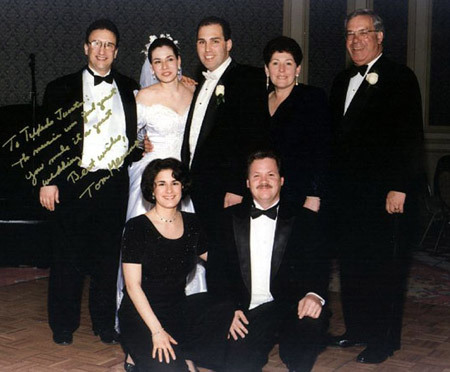 ﻿ Boston wedding band reviews for MA, NH, RI, ME, CT weddings. Boston wedding bands reviews; Boston / New England brides and grooms thank the band. "The music was just great. You made it a great wedding." Larry! The wedding was fabulous. Your band exceeded my expectations in every regard. Thank you again for contributing in such a big way to its success. Our guests haven't stopped phoning me to rave about the band. Officer's Club - Newport, R.I. Tuxedo Junction really blew our socks off. The energy and fantastic music you brought us on Saturday was amazing. The ceremony music and cocktail hour music was perfect and then the reception music was just incredible. You guys are so talented. Everyone was raving about you guys. We cannot thank you and the whole band enough for making our wedding so amazing. It was such a pleasure to work with you and we are so grateful for your hard efforts and collaboration. Thank you for taking our requests seriously and being so professional. We couldn't be happier!!! Bradley Estate - Canton, MA. Tuxedo Junction was our wedding band in March 2018. They were absolutely fantastic! Larry was our contact person and he made sure all our special requests were accommodated. Their sound is great and they are very flexible. Our guests all commented on the band and we were very pleased with the performance. We would highly recommend them to anyone planning a wedding or any other event. I am so pleased that we chose your band to play for our daughter's wedding reception. You were easy to work with. You responded to my questions and concerns quickly. And you delivered what you promised. My first concern was volume. I wanted our guests to be able to converse comfortably while others were dancing. Another concern was variety. I wanted music that spanned the decades from the '40s to present. My final concern was the pace of the evening--including introductions, traditions and speeches. To my delight, all my concerns were unfounded. Our guests were able to hear each other speak while your band was playing. People of all ages enjoyed dancing to music that they loved. And the evening progressed beautifully. Our guests clearly enjoyed themselves, as evidenced by their staying until the final dance and their unsolicited praise for the band. If I had another daughter, I would definitely hire you to play at her wedding reception!!! Nov 18, 2017 - Temple Beth-El, Hartford, CT. Tuxedo Junction brought magic to our wedding reception!! Our guests quite literally danced all night! Every tune was delivered with amazing musicianship, authentic style and charged energy. The band breathed life into an otherwise formal church hall. They were everything we hoped for and more-- flexible, amenable, creative, collaborative and fun!!! ... "Larry, we want to pull off a flash mob scene. Oh, and it's a surprise for my wife." ... "We have a few musician friends who want to sing with the band, probably jazz standards." ... "There's a Peter Mayer tune that has choral back up. We'd love for the band to play if possible." "Sure no problem", said Larry to each of these requests, eager to please. We had a blast! Tuxedo Junction played a monumental role in helping us to create amazing memories. We are forever thankful!! Our guests raved about how much they loved our band! Everyone was up dancing! Once again wanted to thank you and all the members of the band for making our 50th Anniversary an event we will never forget. We are still getting phone calls from our guests telling us that it was one of the best events they ever attended. The music was outstanding. Teresa's Italian Eatery - Middleton, Mass. We want to thank you SO MUCH for an unforgettable wedding. You guys were truly amazing and everyone raved about the band the next day!! Thanks for all of your help along the way with planning too. You were so great to work with and again, did an AWESOME job!! We can't thank you guys enough! I would very highly recommend Tuxedo Junction. Hands down, they were phenomenal! We were married in a venue that really called for a band, vs. DJ, and we were beyond pleased with our choice. Larry and his colleagues were super professional and worked with us leading up to the wedding in terms of music selection, and even learned a few songs to surprise key folks at the wedding. In fact, they learned "Because of You", since it was my parents wedding song. I received so many compliments from guests about how wonderful the music was at our wedding .. it was such an amazingly memorable day, and Tuxedo Junction helped to make that happen. We want to thank you and the band for helping make our wedding one to remember! We have received so many compliments on the band, and we have to agree with every one of them because your music was fantastic and everyone was dancing all night! You all were a pleasure to work with and we are so thankful that you played our wedding. Salem Cross Inn - W. Brookfield, MA. Simply put, Tuxedo Junction is an incredible wedding band! My daughter's wedding at the Salem Cross Inn was perfect and Tuxedo Junction complemented the perfection. Easy to work with, open minded, and VERY talented, they had the place rockin', jumpin', jazzin' and dancin' during the entire reception. And they can MC as well. The wedding party introduction with complementary music was flawless. They have both male and female vocalists who have 5 star voices. And all 6 of them are fabulous musicians. Guests were amazed by the music for all ages and genres and how the dance floor was full the entire evening. Folks, Tuxedo Junction is a powerhouse wedding band. And the price is right as well. You will be amazed by this band in every way. We had never heard Tuxedo Junction in person before our wedding reception. We had only listened to the clips on the website, which sounded great but I was still a little uncertain about what to expect from the live band. When the band started to play I was astounded with how good they sounded. Not only did the band exceed our expectations compared to their recordings, but our guests kept telling us how amazing the band was throughout the evening. We could not have asked for a better band to play for our reception. Tuxedo Junction took our reception and dancing to the next level. We would book them again in a heatbeat! Thank you and your band for doing such a fantastic job at Katy's wedding reception. She loved the way everyone sang and the range of music you played throughout the evening. Everyone we spoke with appreciated how you modulated your volume. The band sounded great, both during the early part of the reception and later on when everyone wanted to dance, but it was always possible to converse with friends and family without having to shout in their ears! Tuxedo Junction truly helped make my daugter's wedding a very special day. Harvest Restaurant - Cambridge, Mass. You guys killed at our wedding!!! I am so glad you could play for Barb, myself and our guests! You and your band are true professionals. You set an ambience that we could not have imagined. My biggest piece of advice to your future wedding clients would be to get a bigger dance floor! I have spoken to all the guests from the reception and to a person, they all comment on and ask about the band. Thank You! Private residence - St. Andrews, N.B. I just wanted to say how happy we were with your presence and performance at our daughter's wedding. EVERYONE kept telling us how amazing the band was! You surpassed even our expectations! I hardly got to eat anything because I couldn't stop dancing - every next song was better than the previous one. And a special thanks for learning Emilyann and Michael's special song on such short notice. I am sure there are many people from our event who will be booking you at their next event. A special thank you for a wonderful performance on Saturday. I can't count the number of compliments your band received from our guests. You provided a great mix of songs which pleased everyone. Since the guests ranged in age from 3 mos. to 87 years, that was an exceptional feat - not to mention that I gave you zero input! Your band was marvelous and the singers likewise. All of your members were courteous, personable, and professional. You helped make our 50th anniversary celebration an upbeat occasion. I would be more than happy to give Tuxedo Junction a very positive recommendation if ever requested. I am a very happy customer. My father and I love music. We both have large libraries and specific tastes; especially when it comes to what makes us dance. I got lucky and saw Tuxedo Junction play at a friends wedding, and my wife and I knew then that they would be right for us and make my father proud. Simply put, the band was affordable, accommodating, sounded amazing, and made everyone at my wedding dance. Tuxedo Junction played with 6 musicians at my wedding. They do not have a recorded music library for your ceremony, but they will make suggestions and coordinate the music during the ceremony. I bought my ceremony music on iTunes and spent less than $10. Larry walked us through the timeline from the band’s perspective, and had a worksheet to fill out with info for announcements, first dance, etc. For those with day jobs, Tuxedo Junction would regularly take scheduled calls after 5pm, which was so convenient. I surprised my bride by singing a song I wrote for her. With some inspiration, lyrics, and a melody, Larry gave me his time and effort to write backing tracks and offered great advice. He took my feedback graciously, and the song came out just how I wanted it. Tuxedo Junction has a fantastic song list that exceeded our expectations. The band knows what songs to pick and how to control volume to keep the energy up, not hurt anyone's ears, make sure to hit on my favorites, and avoid anything I didn’t like. Our guests unanimously loved the band, saying things like “I can’t believe how good they sound!". Dancing was non-stop with nearly every guest finding a song they couldn’t resist. They also had no issue playing music I provided during their break. Tuxedo Junction gave us a jazzy, lite-rock dinner with an upbeat dance party reception, but the beauty of this band is they have the skill and the song list to give you anything you want and do it well. They will exceed your expectations, but not your budget. I want to tell you that we had many, many compliments about your band on Saturday night. The song mix was excellent, and everyone had a fantastic time on the dance floor, so thank you!! Thank you on behalf of our entire family for providing the perfect music for Hilary and Corey's wedding! Our guests thoroughly enjoyed it from the minute they entered the ballroom until the last dance! The dancing began before dinner was even served and the floor was constantly full until midnight! I wanted to pass along the countless compliments given the band from all of the guests as well. Your music certainly brought the party to another level and kept it going all night! Thanks again for helping make the reception everything they dreamed of! I wanted to thank you and the band so much for the fantastic show you put on. You really put our wedding over the top. People loved your band and were amazed by such authentic covers. I personally can’t thank you enough for learning two of my songs. Tuxedo Junction was AWESOME!!!!! You guys knocked our socks off on Sunday night. Such high quality sound, great music selections, and so much FUN!!!! And you were all so nice to work with. Thank you, thank you for helping to make our reception such an awesome party. I will definitely recommend you to our friends! Enjoy the rest of your summer, and thank you again! When we were planning our wedding and going through all the decisions like the menu and table seating, it was really nice to not even have to think about the music. After we saw you guys play my brother Andrew’s wedding a couple of years ago, we said before the end of the night we had to have you play our wedding too. We thought you were even better at our reception, probably because your song list had more of our personal favorites. Our video shows how crazy the dance floor was all night with everyone up and having an awesome time. I would tell anyone to hire Tuxedo Junction without a second thought. The songs on your website sounded even better in person. I cannot thank you enough for the wonderful music and entertainment you provided for our daughter's wedding reception! When we were first planning the wedding, we decided that the band was to be given top priority, as we believe that is the most critical part of the reception. The venue, food, flowers, etc. need to be good, but if the band does not get the guests up and dancing, the party really is not so much fun!! Your band performed beyond our expectations in every way, and our guests are still telling us how "awesome the band was!!" You all certainly knew how to engage the crowd as well and determine the appropriate songs to play. It seems if I was not up dancing myself, and if I looked at the dance floor from afar, it was packed and there was hardly a person sitting at their table. Even my 82 year old mother commented several times about how great you were and how she loved your beat!! So, suffice it to say, we were extremely pleased and thrilled with all you did to make the reception magical and memorable beyond words. Please know we will highly recommend you to anyone that needs a top-notch band for their function. A million thanks!!! Thank you once again for everything you and your band did to help make our wedding day everything Chris and I had hoped for! Working with you throughout all of the planning was a real pleasure, and you were so helpful in putting my mind at ease! Your band kept the reception flowing, and you kept the guests engaged from the introductions right up through our last dance. My dad and I would also like to thank you for taking the time to learn the Beatles song, which you sang beautifully. I don’t know if you could tell, but he was starting to get choked up a short time after we started our dance. Just wanted to let you know how much everyone enjoyed the band at the wedding. Many people asked where I found the band. They all raved about how good you were. Your band made the reception flow nicely and had everyone dancing all of the time. I had many people tell me that it was one of the best weddings they had ever gone to. I truly believe the music sets the whole tone. You did a wonderful job learning the song we requested for our last dance. It made the day complete. Job well done!! Thank you so much for the fantastic job Tuxedo Junction did at our wedding reception. We got so many compliments on the band! You guys really kept the energy level up and the people on the dance floor. We had a fantastic time and so did all of our guests. Thank you all again! I just wanted to thank you and the band members for another great party!!! People are still talking about what a great band we had at the wedding. Teeny and Luke were thrilled with the song selections and their wishes were fulfilled. The guests danced the night away!! Please let your band members how much we enjoyed the music. You guys were awesome on Saturday. Everyone had such great things to say about the band. Frances and I couldn't have been happier! Omni Parker House - Boston, Mass. Chris and I can't thank you enough for all you did to make our wedding day so special. Our guests were raving about how great the music was and this was evident by the number of people on the dance floor. We'll never forget the loud cheer from the crowd when you agreed to play for an additional half hour. We're so grateful that you took the time to learn our father/daughter song and even flawlessly performed a traditional Lebanese song when we threw you the curve ball during the reception. You are not only talented musicians, but also wonderful people. The venue wedding planner approached us the next day saying how polite and courteous you all were to the staff at Sebasco. Thanks again for such a wonderful party. We would be the first to recommend you and hope to see you perform again soon. The whole wedding experience was so wonderful and your band made it perfect. The announcing was perfect, the woman singer had a wonderful voice! We were just beyond thrilled! It is always a bit difficult to engage with a band that you have never actually heard! This was a HUGE success and we just want everyone in the band to know how much we loved them and appreciated all they did for Julie's wedding. Thank you so much for your fantastic performance at our wedding. You really made our reception very special and memorable. All of our guests had wonderful things to say about you, and you made the night so much fun for everyone. Thank you for taking all of our specific requests into account throughout the night. Larry, we got more compliments about your band. Our 50th wedding anniversary party was a hit!! Everyone called, emailed or sent me thank you notes for a great time. I just wanted to drop you a note and let you know what a fantastic night we had and we owe a lot of it to you and the rest of Tuxedo Junction. We had our monthly Church Committee meeting last night and that’s all people were talking about. I wanted to tell you that I have been going to this Church for close to 30 years and have been to many functions, that Saturday night I saw couples on the dance floor that I had never seen dance before, something very special. You guys were absolutely great. The biggest thing I noticed was that you took the energy from the crowd and turned it around and gave it right back to us. Few performers can do that and you all did it very well. Please let the rest of the band know that everyone had a wonderful time. Once again thank you for a great evening. Thank you so much to you and Tuxedo Junction for helping to make my daughter Ashley's wedding such a monumentally special day this past Saturday. Your wonderful musicianship, superb vocals, master showmanship, musical diversity, attention to detail and uncanny ability to deliver a song in its intended style is unsurpassed. My wedding toast was well received I believe in large part due to your superb sound system and pinpoint fade in and fade out of the selected song snippets. Thank you for your eager participation in our joint venture toast. Again, my best regards to a very talented group of musicians whom I hold in very high esteem. Thank you so much. Larry, we got SO many compliments on the band and we could not be happier with the music. We would not be hesitant to recommend you to all our friends and family. The wedding was an enormous success (I would call it a home run) and the band had a lot to do with it. Westin Copley Place - Boston, Mass. Thank you so, so, so much for playing at the eastern tandem rally last Saturday at UCONN. Wow! Your music was fantastic, and thank you for playing the classics I had requested. I loved the vocals (male and female). I loved how everyone was dancing every song. I guess they were not too tired to dance. I had such a blast dancing. It's been a long time since I've had so much fun. We received many remarks about how amazing the band was! I hope you get some referrals for weddings, etc. from your visit to CT. Thank you again. We truly appreciated your time and talent. Thank you so much!! Your band was absolutely fantastic!! You received rave reviews from the crowd and really made it a special day for all. Again, from the bottom of my heart I thank you. We knew you guys were the right band for us when we first listened to the CD you sent us around 10 months ago. But we were truly amazed at your incredible live performance at our wedding reception! It was better than we had ever imagined!! We are still receiving phone calls from friends and family members who keep raving about how your band made the whole evening come alive! We loved working with you during the entire process, and greatly appreciate your willingness to “go the extra step” in learning our special requests. We will recommend you enthusiastically to everyone we run into who is planning a wedding. Tuxedo Junction did an AMAZING job playing at our wedding last night! The compliments keep rolling in! Thank you for making our wedding a night unforgettable! The band was spectacular. The night went as I had hoped, a big party. You all kept everyone dancing the whole night. The dance floor was so crowded from the moment you started until you left. I have had many ask who you all were and where you all were from. The Harbor Events Center said that they would keep you on their list. You impressed everyone. Hoorah for Tuxedo Junction. You all have great voices, you are always on key. That is truly hard to find in a band. Thank you for learning our first dance song and thank you for being so much fun for us and all the guests. You made the evening the best. Long overdue review... but you guys are amazing!! Someone recently mentioned to me how much fun our wedding was... and when I look back, you were a huge part of that! You had all our guests, young and old on the dance floor all night! I always said that the most important thing for me was that my guests had fun... and you certainly accomplished that! I was going to get a DJ to save on expenses, but I'm so glad I didn't. The band was excellent! When they were playing, everybody was dancing - from my teenage cousins to my 87 year old grandmother. I didn't provide a list of songs to play or not play, so they chose a little of everything for everybody. I asked them to play Yellow Submarine by the Beatles for the Father/Daughter dance. Since this was definitely 'unconventional' they had to learn the song for us and it turned out great. My Dad and I had so much fun! I would absolutely recommend hiring this band. We wanted to thank you again for the wonderful performance Tuxedo Junction provided at our wedding. Your band created the perfect atmosphere for our wedding from the very beginning to the last dance. We've had many compliments on the band from our family and friends. At one point in the evening my cousin went downstairs to use the restroom. A woman who had been eating at the restaurant asked him if he was from the wedding upstairs. When he told her that he was she told him that she and her husband had enjoyed listening to the music so much that they had kept ordering things so they could stay and listen. Thank you for your professionalism and fabulous performance. We will definitely be recommending Tuxedo Junction to everyone! We want to thank you so much for making Leigh's wedding the success that it was. My husband and I are from the era when everyone had bands at their weddings, and so this is what we wanted for our daughter's wedding as well. Leigh and Leo were OK with it right from the start, but I will say that we heard concerns from our son that your songs would not be "danceable". While I knew you would not be playing techno or Metallica, I begged to differ with him. This was an on-going discussion for weeks with our son, who maintained the position that our daughter would be sorry that we hired a band instead of going for the more contemporary DJ. I'm more than pleased that he was forced to eat his words and admit that you were a "fabulous" band, as was attested to by the sheer number of people who were up on the dance floor. He was only one of a group of people who complimented us on your band and how great your singers were. Thank you for being a large part of the reason the evening was the success that it was! I just wanted to again thank you for helping make our wedding SO MUCH FUN!!! Everyone had a great time and our family and friends have not stopped raving about the music. I can speak for myself though as being a prime example because I think I was off of the dance floor for only 1 maybe 2 songs and that was it! You guys were great and Jimmy and I will definitely recommend you to anyone we know planning an event in the future. Thanks again and enjoy the rest of the summer! Springfield CC – Springfield, Mass. I am so sorry It took me so long to e-mail you about what a fantastic, unbelievable, and professional performance your wonderful band gave us at my daughter Francesca's wedding. Honestly, people are still e-mailing and calling us about the wedding and about how great the band was. We can never thank you and the band enough for helping making Francesca and Damon's wedding so spectacular. Should you ever need to have someone call us personally to give you any recommendations, please feel free to give them my name and number or Francesca's number. We are telling everyone we know who may need a band in the future your number and name, and adding if they do not call you they are making a Big mistake - You are The Best!!!!!! Many thanks to you and your band for a wonderful performance at our wedding in May. We received a lot of compliments on the music, even months after the reception. Everyone had a wonderful time, in large part because you kept them up dancing the entire night! In addition, thanks for letting me get up to play guitar with you. I know it takes a leap of faith when you haven’t had the chance to rehearse with me. Thanks again for everything! I am home from my honeymoon and wanted to drop you a note to say thank you. Your band did a fantastic job at my wedding on May 8th. All the guests were raving about how great the band was. You had everyone up on the floor and dancing all night! I can't thank you enough. You did everything that I asked, including learning a new song for the cake cutting, and playing the Dubke for all the Lebanese guests. My mom and I really appreciate it all and the great music made the night even more special! Thanks so much. I will be sure to recommend you and your band for future friends/ family weddings! See our live music selection ... Listen online. Live music for weddings, events in MA, RI, NH, ME, CT, VT.